Joon-ho Bong’s English language debut has been a long time coming, but after what seems like years of status updates (including worries that the international version might be cut) Snowpiercer is finally here in all its madcap glory. Set in the near future, when the world has succumbed to a new ice age, Snowpiercer tells the story of the few survivors who live on a perpetually moving train. The train is, of course, massive, with a clear division amongst the passengers. All the rich people live up the front, whilst the poorer folk are squashed in the back carriages like cattle. 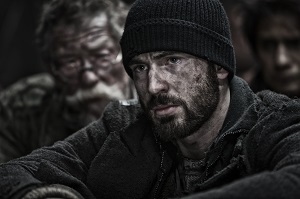 Curtis (Chris Evans) takes it upon himself to start a revolution, and is determined to make it to the head of the train. As high concept sci-fi goes, this is a wonderful premise. Sure, the social commentary about the gulf between rich and poor is rather blunt (as it was with Elysium, and less so with The Hunger Games), but it doesn’t threaten to overwhelm the narrative. If you’ve seen The Host (Gwoemul), then you know what kind of tonal variety to expect. Just when you think that Snowpiercer has settled into a Hollywood action movie rhythm, up pops some slapstick humour. Then wham, suddenly it’s turned into a bloody horror film. The film is often reminiscent of the work of Terry Gilliam, specifically Brazil, and I’m sure it will be that little bit too weird for some. The trick is to not go in expecting any one type of movie. It might have Chris Evans playing it straight as the film’s handsome hero, but it also boasts Tilda Swinton looking like she’s popped out of a pantomime. You have Luke Pasqualino from ‘Skins’ as a kick-arse muscle-bound action hero, but then you have Alison Pill playing a teacher who appears to have dropped out of The Stepford Wives. It’s great to see a film so reliant on practical sets, even if said sets get reused in different contexts. There’s something wonderfully tactile about the film, though the just-good-enough visual effects don’t do much in its favour. Part gritty post-apocalyptic drama, part ridiculous farce, Snowpiercer is difficult to define. It’s a more consistent film than The Host, which had a boring middle section, and it’s got a fantastic international cast. The film comes highly recommended, with the proviso that it will surprise and bemuse you more than once. Snowpiercer is released in Australia on 24 July. This entry was posted in Film Reviews and tagged Action/Adventure, Comic Book, Farce, Science Fiction by Stuart Wilson. Bookmark the permalink.